Jancik Arts is working on an oval stained glass ceiling dome for a private residence. Very few stained glass studios have the expertise to create a true oval dome. In this article, we are covering the basics of ordering a custom stained glass ceiling dome. While budget is often the main driver for stained glass domes, there are many aspects that should be taken into account. “Can you produce a large 7’-0” x 11’-0” oval dome that includes the frame and stained glass?” Our answer was a resounding “Yes!” “How did you hear about us?” we asked. It’s a fact that very few companies in the United States have this capability. You might wonder why an oval shaped dome would be more difficult to create than a round one. When it comes to ceiling domes, there are many choices: square, hexagonal or octagonal, round, race track shape, and, finally, the most difficult, a true oval. Why is a true oval dome more complex? As the compound curve moves around the perimeter and from base to apex, the double radii prevent one from creating any regular or typical shape per wedge. As an example, a round dome can be divided into exact equal parts, thereby, requiring only one form or mold needed to meet the curve requirements of all sections or wedges. The oval dome, on the other hand, requires that molds be built for an entire half of the dome frame, as each quarter of the dome is only duplicated once. Given the determined shape, the frame can be very different as well, from faceted (or geodesic), which is a less expensive construction, to the more exquisite compound curved dome. Most often, the budget determines how complex the dome will be. Factoring into the end cost is the design complexity (actual number of pieces); whether the dome is to be geodesic or curved; the type of glass that is used; whether crystal jewels or other accent features are included; and the rise of the dome (the higher the rise, the more surface area is involved). What is the distance from the floor to the underside or perimeter ring of the dome? What rise do you prefer, and is the attic space high enough to accommodate that rise? Would you rather we determine the rise for you? Who besides the general contractor will be involved in the decision making: the owner, the architect, or the interior designer? -Is there a particular design style of the structure or the room where the dome will be installed? -Do you have any drawings or visuals of the structure as it exists or as it is projected to look? -What are the preferred colors, and can you share samples of architectural elements, i.e., floor, ceiling, and wall materials? -Have you seen any designs, whether it is wrought iron work, fabrics, or other, that you find appealing and appropriate? With the information you provide, we will be able to draft a proposal that will outline a range of projected costs, including the construction of a quality structural metal frame, the construction of quality stained and leaded glass (more on that in a later article), two design options, shop drawings (so that the structure opening will be aligned in measurements with the frame size), frame finish samples and glass samples, wood box crating for the stained glass panels that will be shipped separately from the wood box crated metal frame, and, if requested, the estimated cost of freight, engineering stamp, and installation supervision. Once the proposal is accepted, expect it to take approximately 4 – 6 months from approval of shop drawings and design to completion of a smaller dome (less than 8’-0” diameter for a round dome) and up to approximately 7 or more months for very large structures. Each piece of glass is hand cut and will be handled seven times by the stained glass craft master. This truly is an Old World art that has been honed for the millennium; however, the basics remain the same. Schedule is determined according to the scope of work and current studio workload. 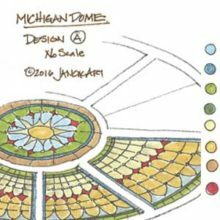 To ensure that the dome is completed on time, plan to contact the stained glass studio in the beginning stages of your construction/remodeling project or, even better, during the conceptual stage of the project. For 37 years, Jancik Arts International, Inc. (JAI, Inc.), an architectural art glass and art metal studio based in Atlanta, Georgia, worked on a variety of projects—many aboard cruise ships— including dozens of stained glass domes measuring 20 plus feet in diameter, and decorative metal grilles for 30-foot high elevators. For additional information, call Angelique Jackson, president of Jancik Arts International, Inc. at 678-428-3351, or contact us via our website.